Drenched in sunshine year-round, the Arizona towns of Peoria and Glendale are popular destinations among those looking to escape colder climates as well as those looking to enjoy some great baseball. As a baseball spring training destination, Peoria and its surrounding towns attract large crowds of baseball lovers every spring. During the winter, these towns become havens for visitors flocking to the warmth and the sunshine, which is why both Peoria and Glendale are home to a number of great resorts. If you want to stay at one of the best resorts in Glendale AZ during your upcoming desert getaway, be sure to work with Vacatia to book your accommodations. 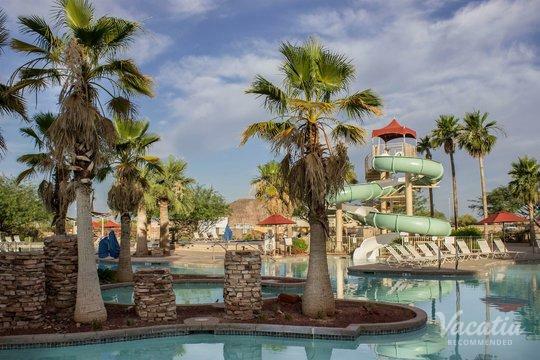 There are a number of great resorts in Peoria AZ to choose from when you begin planning your trip, but Vacatia makes it easy to find the very best vacation rental available. Vacatia provides travelers with high quality vacation rentals that combine the best of a home with the best of a resort, which means that you can enjoy the best of both worlds during your next Arizona vacation. Arizona boasts warm sunshine every month of the year, which is why Peoria and Glendale are hot spots in spring as well as winter. If you want to elevate the experience of your Arizona vacation, you should rely on Vacatia to book your accommodations. When you rely on Vacatia to help plan your next trip, you can rest assured that you will have a spacious, comfortable vacation rental to call home during your Arizona getaway. Rather than staying at one of the many hotels in Glendale AZ, you could work with Vacatia to find a spacious, comfortable vacation rental that offers so much more than a typical hotel. Every Vacatia rental property provides the added comforts and conveniences of home, such as a fully equipped kitchen, in addition to the desirable services of a resort. So if you want to enjoy both comfort and luxury during your Arizona getaway, you should book your stay at a Vacatia rental property rather than one of the hotels in Peoria AZ. When you stay at a Vacatia rental property, you are sure to feel right at home in this beautiful Arizona location. Both Peoria and Glendale are located just outside of Phoenix, and they are blessed with warm sunshine and beautiful desert views year-round. Peoria is a host of spring training for baseball teams like the Seattle Mariners and the San Diego Padres, so this picturesque desert town floods with eager baseball fans every spring. Similarly, Glendale is also a popular destination for sun-seekers and outdoor adventurers. These sun-soaked Arizona towns provide the perfect climate and destination for activities like hiking, biking, playing tennis, and golfing, so you can indulge in a variety of sports and activities during your Arizona getaway. If you want to further enhance the quality of your Arizona vacation, be sure to book your accommodations through Vacatia, which will ensure that you have a comfortable, spacious home away from home in beautiful Arizona.